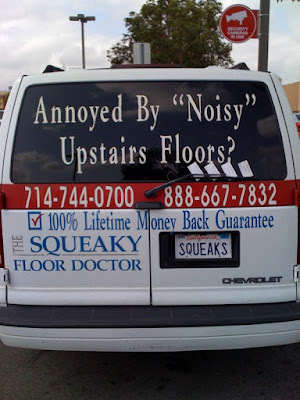 The “Blog” of “Unnecessary” Quotation Marks: "noisy" eh? These people will make your upstairs neighbors stop jumping around or whatever it is they do. I wish I had that when I lived on a first floor apartment. Thanks, Benjamin. With the word in quotes it could be assumed the floors are only a problem for fussy types. Also, the company name seems to emphasize the Squeaky (underlined and larger) does that mean the 'doctor' himself squeaks? lolzzzz...Wow! Great Blog you got out here!